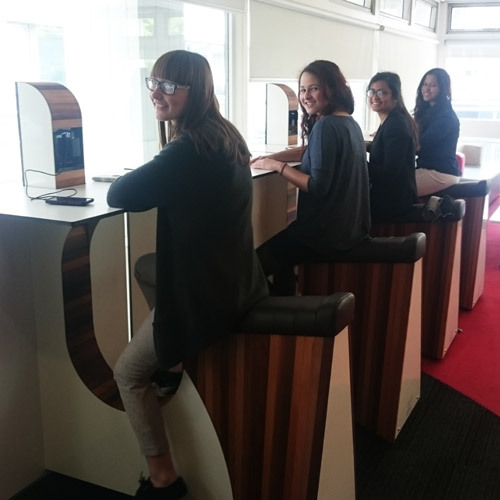 We've installed 4 new cycle-powered phone charger desks in the Library, offering you the chance to save energy, keep in shape and study at the same time. The new bike desks, from Belgian company WeWatt, convert the calories you burn while exercising into electricity for your phone, tablet, or even laptop - just bring your charger with you, plug in and get cycling. The bikes themselves are created from sustainable and recycled materials, and have been used in many different European countries. Each of them is hand made, with high ethical standards maintained for workers. They've made it to Warwick thanks to a collaboration between the Estates Office, the Energy GRP team and the Library. The desks feature standard 3-pronged British plugs, so make sure you have the correct adapter with you.